This quote sums up my perspective on life very well – you can’t just look at a fragment of a whole, and wherever such a fragment is caused to leave its place, it affects the balance of everything else. My vision of good health in any living being is a house, built on a strong, well anchored foundation, with solid walls that support a protective roof. Every single part of this structure is important in itself but also affects all other parts. They cannot fulfill their roles as they are meant to do unless fully functional and in proper balance. Dogs are no exception to this analogy, but it is easy to forget that their “architecture” is different from ours, and of course also varies from individual to individual. What’s perfect for one will not necessarily work for another. Since no particular approach for nutrition and care is right for every dog out there, I am here to take it to a personal level, under consideration of the individual needs of each dog as well as the life circumstances of their humans. Nutrition is the foundation for good health. The body must have all required nutrients at its disposal in sufficient quantities for development, maintenance and renewal of all types of tissues and production of energy. Different parts (such as for example bones, fatty tissues, liver) also serve as “storage facilities”, releasing nutrients in time of shortages, and storing them again when they are available in large enough amounts to build reserves. Our dogs depend on us to supply what they need, but just exactly what is not always obvious, and neither is the fact that too much of something can be just as detrimental as not enough – to both health and behavior. Most commercial foods on the market cater more to people’s emotions by offering foods for different life stages or sizes of breeds, but ads and product literature generally fail to explain that just because the label of a food says it has been formulated for senior dogs or large breeds this does not mean that no young adult or small breed should ever eat it, or that the particular formulation may even be beneficial for dogs with certain dietary requirements. Educating people about this has been my mission ever since I launched the Dog Food Project website, and by offering consultations with a focus on specific individual details here at Better Dog Care, I’m taking that education to a personal level – with results that can not be achieved by providing general information only. My services are not limited to commercial food and supplements though, but also cover home prepared cooked and raw diets. Exercise is important for keeping the body and heart conditioned and in good shape – this goes for athletic dogs just as much as for the couch potatoes. Letting dogs be lazy all the time isn’t doing them a favor, even the ones who are not cut out to be jogging partners benefit from a nice, brisk walk every day to get their blood circulation and digestive tract going. In addition to that, dogs who are well exercised are less likely to be excessively hyper, chew on inappropriate items and display other inappropriate outlets for their boredom or stress. How much, and what type of exercise is appropriate for an individual depends on age, body condition, build (for example special care needs to be taken with brachycephalic breeds, which are also very sensitive to heat) and other factors. Just like the body, the brain needs exercise too. People can meet other people, read a book, turn on the TV or surf the internet whenever they are bored, our canine friends have to rely on us for entertainment just like for food. Daily walks give the dog a chance to see new things and smell new smells, and short, fun training sessions or challenging toys provide variety as well. Most dogs are excellent problem solvers and love working on learning new tricks, so encourage them to use their brain instead of just handing out “freebie” treats. Providing enough mental stimulation is another excellent way to curb undesirable behaviors dogs engage in when they become bored or stressed. You don’t have to train to competition levels in obedience or agility if you don’t want to, but taking classes to learn the basics and then using them for fun in your own home or back yard is a great way to bond and have fun with your dog. Everyone knows that a dog needs to be brushed (frequency depending on coat length and texture), have his nails trimmed and ears cleaned every so often, but few people realize that being “dirty” today has a completely different meaning than for example 50 years ago – especially for the “urban hounds” who live in large cities. There is so much more pollution now, both from above (air, rain) and below (car tires abrading on asphalt, dust binding pollutants and settling), and dogs generally are lower to the ground than people and have the added disadvantage of not being able to put on a clean change of clothes every day, so they are much more exposed. The popular opinion is still that bathing is detrimental to a dog’s skin and coat and that they should only be given a bath when it is “absolutely necessary”, which reminds me of the 16th century in Europe, when people still believed this to be true for humans as well. Today there are excellent, mild products available that do not contain harsh soaps and chemicals, do not strip the skin of its protective oils and are completely biodegradable, so there is no reason to feel guilty if you think that your dog could benefit from more frequent baths – especially if he or she is suffering from allergies. Choose products wisely though, the often recommended oatmeal shampoos or conditioners that are supposed to relieve itching may have the exactly opposite effect if the dog is allergic or sensitive to oats! I don’t think I have to explain much about this one, it’s really just common sense: limit exposure to pollution and harmful chemicals, play with, exercise and transport your dog safely, keep harmful items and substances well out of the dog’s reach at all times, have your dog microchipped and wearing an ID tag on the collar so she can be returned to you in case she gets lost and have a dog first aid kit handy at all times. Last but certainly not least, if you want your dog to be truly healthy, it is important to take emotional needs into consideration as well. It is obvious that a dog should never be chained out in the back yard and then forgotten, but that’s not all. A dog is a pack animal with a social background that’s vastly different from that of humans, yet they are wonderfully adaptable and working hard on “fitting in” – which is not easy at all, since canids and humans also communicate in completely different ways. It is important to give dogs the training and socialization they need to be comfortable in the environment they live in, otherwise they become stressed and try to cope with this stress and the resulting fears in any way they can – nuisance barking, aggression, depression, hyperactivity, obsessive-compulsive behaviors: in short, all the undesirable things that people do not like about dogs and that leads to them being dumped at shelters before they are even two years old. It is common for people to bring home young puppies and have unrealistic expectations in their level of self control in many different ways, starting with house training (not soiling in inappropriate places) and not ending at being able to handle being alone for long periods of time without complaint (when the humans leave for work and school), right after being separated from mother and littermates. Suddenly they are being disciplined for things they don’t know better and have yet to learn, which creates an immense amount of stress and sets them up for failure at the time where it should actually be easiest to train them with very simple, effective methods. Providing emotional security means taking on the role of a pack leader and guiding your dog’s life by making the right decisions and setting boundaries. By this, I don’t mean following silly, popular notions of having to “establish dominance”, or – dog forbid – trying “alpha rolls” to get an out of control dog to behave, but to create and enforce a set of rules that clearly outlines the dog’s position in your family pack. Being insecure of one’s rank in the pack is a stress factor in dogs’ lives, and the more “status seeking” a dog is, the more problems are created where it is left up to him to determine this rank – because ultimately he will claim the role of pack leader for himself. This does not mean that you should love your dog any less than you do, or that he doesn’t deserve to be spoiled now and then, but we need to keep in mind that dogs are not little people in fur coats that thrive on being treated like humans. 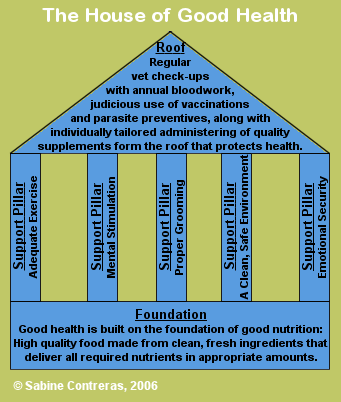 The roof of our model structure of canine health is formed by necessities like regular vet check-ups with annual bloodwork, judicious use of vaccinations (recent studies show that not every dog needs to be vaccinated for every disease under the sun, much less every single year) and parasite preventives such as heartworm and flea meds, and sparingly administered supplements to address individual needs. Even though your veterinarian is a medical professional who has been trained to diagnose health issues, he will only see your dog once or twice a year unless something goes wrong. You, the owner, have the responsibility to pay attention to even subtle changes in your dog’s health and condition and to bring them to the vet’s attention if you have any reason to suspect that a problem may be developing. Do not rely on the annual wellness exam for this! I recommend annual bloodwork so you can establish a baseline for your dog’s normal condition and blood values, which will help interpreting abnormal values when they do occur for some reason. If you have made it this far reading about my philosophy, I know you truly do care about your dog and have his or her best interests in mind. Let me help you create a healthy lifestyle for your canine best friend. Please do not hesitate to contact me with any questions you may have in this regard.